Let’s be honest, being a mom of two is busy, crazy and sometimes kind of messy. I sometimes find it hard to keep up with blogging only about fashion because sometimes I just spend the day in leggings and a t-shirt (I know SUPER FANCY, right?) I’ve really been thinking about this a lot and have decided to start incorporating my “Mom Life” into my blogging. So I am going to start doing a Lifestyle post, hopefully weekly, but let’s get real that might be tough! So here goes my first one!! The last month has been a little crazy with the girls, work and traveling to Kansas City. But, it was time to start incorporating food into Amelia’s daily routine. I have to admit, even though I’ve been through this before with Aria I totally forgot where I was supposed to start, so naturally I went to Google and started searching for ideas. I did some oatmeal here and there and it was going ok. Then it hit me, it’s really about consistency and making a commitment to adding in a meal around the same time every day. 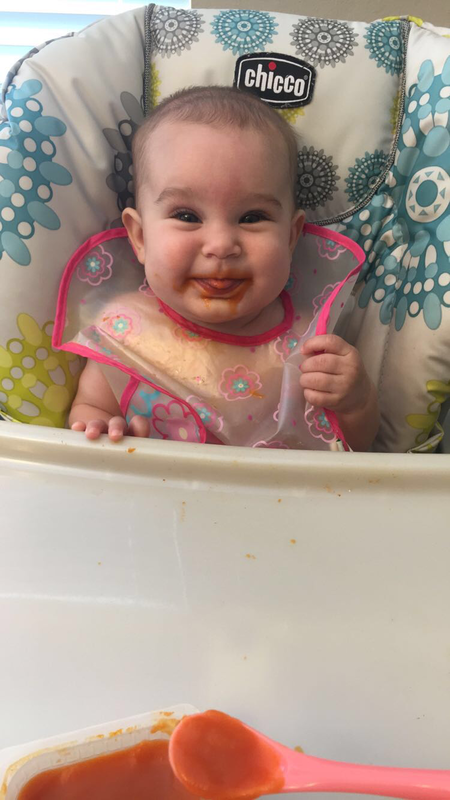 I knew for sure I wouldn’t have the time to make her first foods like I did with Aria, so I turned to Gerber. I went shopping to gather up our first food items. I knew I was going to start with greens first (I didn’t with Aria and I think that was a big mistake) then move to other items. Shopping the Gerber items was so easy, they had everything I needed. 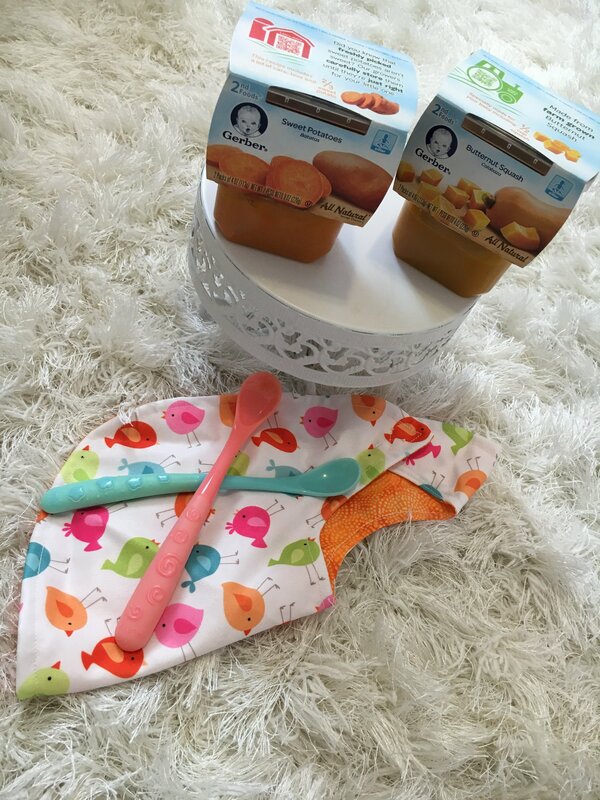 including this My 1st Fruits starter kit…How cute is that? I know, I thought the same thing, I have to get it!! Anyway I decided it would be easiest to start with dinner because mornings can be a little crazy with getting both girls ready and out the door for either school or going to the park. 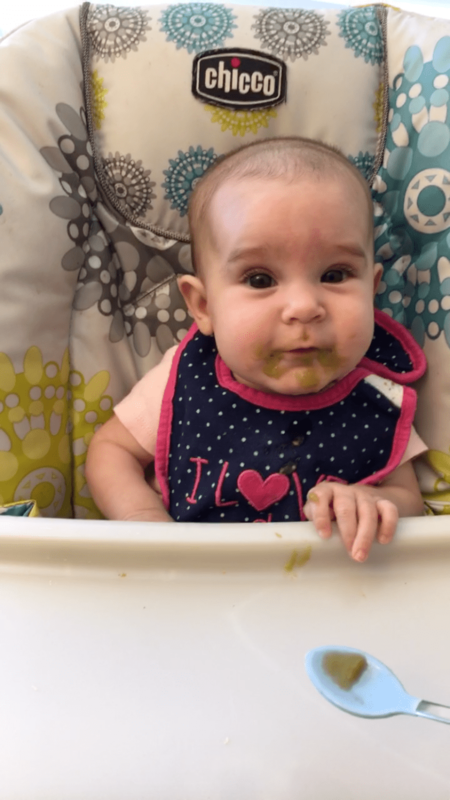 Our first week consisted of green beans and peas….ehh it was rough. I thought to myself, was it really this hard with Aria, surely it wasn’t? 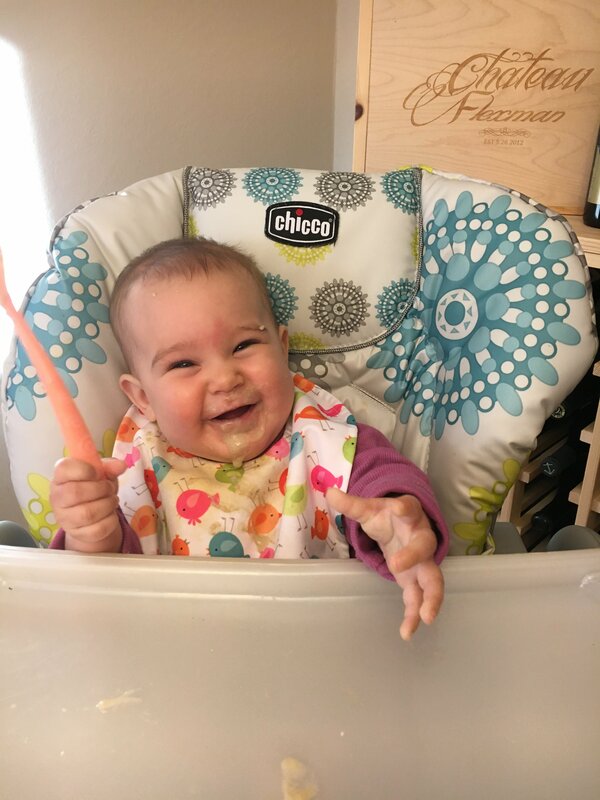 Regardless of how I was feeling, Amelia loved it and was having fun in her highchair, trying to grab the spoon and of course Aria LOVED having her sister join us the table. Within a week or so she got the hang of it. Sort of. Kind of. Well enough to eat 1/4 of it. Then once moving to the orange colors and fruit she LOVED them, I mean destroyed the entire containers! How cute is this bib!?!! My aunt is fantastic at sewing and made them for us! Now, it’s no big deal we just set her in her chair when we eat, I mean it’s actually easier having her up there with us. No passing her back and forth or trying to time dinner with the evening nap. Plus Aria has been really enjoying watching her try new things. 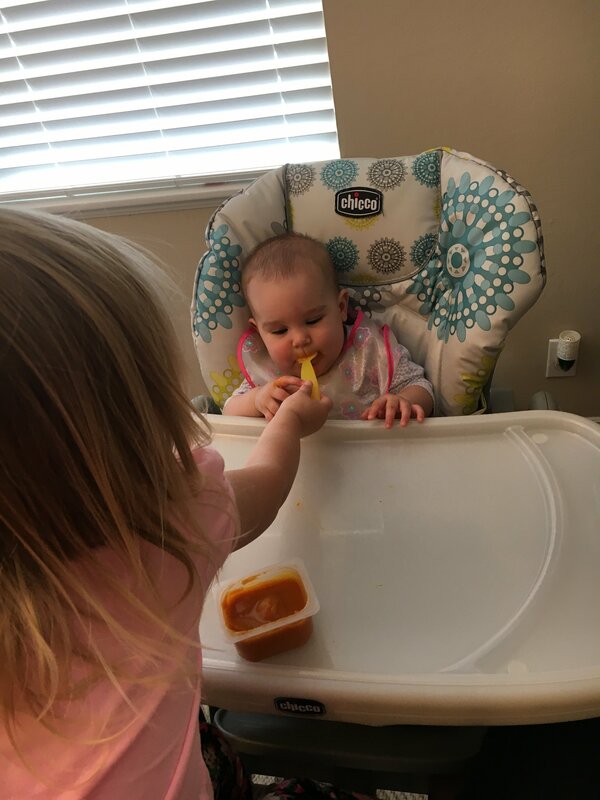 She is just the best helper and loves to help feed her little sister…It’s so cute how much she loves her!